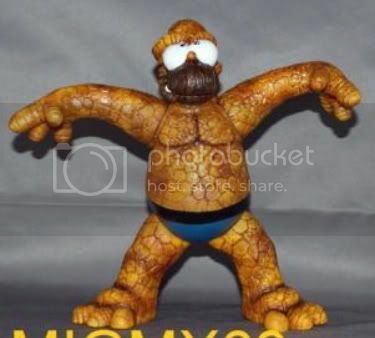 Well… to be more specific: custom toys featuring Homer Simpson as two Marvel superheroes and one supervillain. 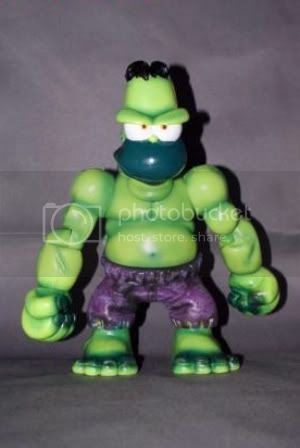 Toycutter found this seller on Ebay who created Homer Hulk, Homer Thing, and Homer Doc Ock. Made in Mexico, with “free shipping from Texas,” these scream “toy smuggling ring.” But who am I to complain about a little bit of illicit border-crossing when America’s toy habit is getting fed? We need our fix, dammit! Hurry it up, Mexico! Daddy’s getting the shakes. These are all well and good, but isn’t a “Homer Wolverine” a gimme? “Mmmmmm… beeeeer, Bub.” Ha, totally. Am I right? Hello? No? Yeah, Ok.
Feel free to top my lame Homer/Marvel catchphrase in the comments. Dude, I live in Mexico. I’ve seen Homer Wolverine, Venom, Superman, Batman, Stormtrooper, Darth Vader, and some others I can’t remember. I decided not to start collecting them as they were like 10 dollars each, and I knew I would never be satisfied until I got every single one they could come up with. And I’m pretty sure they can come up with many more than I can afford.